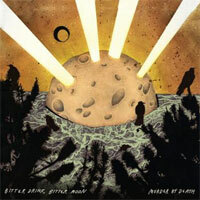 Known for their uniquely brooding sound and frequently desolate imagery, Murder By Death capture a familiar tone on Bitter Drink, Bitter Moon while exploring new territory and adding a further refined sophistication for an even richer, full-bodied sound. From the spare, spooky opener “My Hill”, to the rough and rousing sing-along “Hard World” and the booming, aching waltz of “Ghost Fields,” Bitter Drink, Bitter Moon offers up a sinister sampler of new and interesting sounds. First single “I Can Around” rumbles and rollicks with a hard-charging, barroom flair and is sure to incite fist-pumping sing-alongs amongst Murder By Death’s diehard fans on their upcoming tour.